These cute paper earrings are so quick and easy to make, you'll soon be wearing a different pair of earrings for every occasion as well as knocking a few up for friends and family. These earrings are made from scraps of paper and can be customized using rubber stamps and other embellishments. 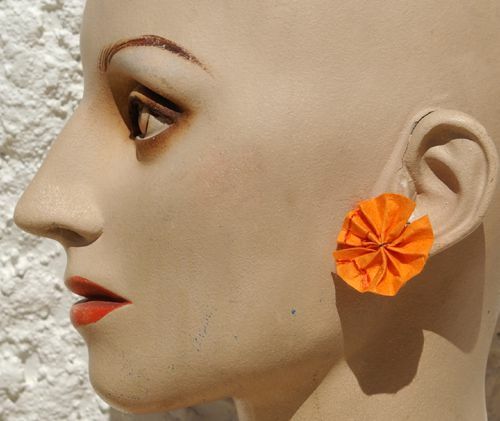 The fun thing about these earrings is that they are made using the same technique as is used to make large paper flowers, we're just working on a much smaller scale. Because these earrings are made from paper, it is unlikely that they are going to survive decades of daily wear and be passed down through the generations. You could either regard these as disposable jewelry or treat the finished earrings with a clear varnish to help protect them. Trim the paper into identical rectangle shapes which are about three times longer than they are wide. Stamp decorations over the surface of the paper. Remember that the paper is going to be concertina folder, therefore don't worry too much about the placing of these images. You are using them to add color and interest. That's all there is to it. This is a quick and easy project. However, if you would like to add a bit more of a challenge you can embellish these earrings in several ways. You might think of making these earrings to celebrate your school, sports team, or a holiday. They are quick to make for gifts or party favors. For a colored edge, use your ink pad to rub along the long edge of the paper before folding it. Use a complementary color to stamp a design before folding the paper. Color inside outline image stamps with bright marker pens. Use a bright color craft wire and make a feature of it by winding it around the middle of the paper several times. Add glitter glue or use metallic gel pens to add shine without having loose glitter. Glue a jewel to a stick, using a dab of strong adhesive, and place it in the middle of the flower.